For the 20th time this season, the Yankees had a game affected by rain (or snow) today. Fortunately they will be able to play tonight. Today’s 1pm ET game became a 7pm ET game because of heavy rain in New York. Things have cleared up now though and they should have no trouble getting the game in tonight. Hooray for that. 9. CF Jackie Bradley Jr. The rain stopped a few hours ago and things will be clear for the game tonight. First pitch is scheduled for 7:05pm ET and you can watch on WPIX locally and MLB Network nationally. Also, you can watch on Facebook Live as well. Enjoy the game. Injury Update: Judge (wrist) took simulated at-bats again today — he faced minor league righty Adonis Rosa, who Aaron Boone said was selected to pitch to Judge because the Yankees are comfortable with his command — and was deemed ready to hit in games. Here’s video of a simulated home run. Interestingly enough, Boone said Judge wouldn’t have been in the lineup for the original 1pm ET start. The delay gave them time to evaluate him and feel good about where he’s at … Aroldis Chapman (knee) feels good after yesterday’s simulated game and could be activated as soon as tomorrow. Roster Moves: Welcome to the big leagues, Justus Sheffield. He was officially called up earlier today and is wearing No. 61. Clint Frazier was transferred to the 60-day DL to clear a 40-man roster spot. Domingo German was called up as well. The Yankees are up to 36 players on the active roster (19 pitchers, 17 position players). Aroldis Chapman (disabled list), Albert Abreu, Domingo Acevedo, and Thairo Estrada are the only 40-man roster players not on the active MLB roster right now. Roster Note: This morning I mentioned A.J. Cole hasn’t pitched in eleven games. Turns out he spent some time away from the team to be with his wife, who gave birth to their first child. He’s back with the team now. The Yankees never bothered to put Cole on paternity leave because there’s no point with rosters expanded. Congrats to the Coles. Folks, there are only four home series and 13 home games remaining this season. Hard to believe, no? The Yankees begin a four-game home series with the rebuilding Tigers tonight. The Tigers have lost five straight games and they’re 7-18 with a -49 (!) run differential this month, so yeah, they’re bad. As expected. They’re early in their rebuild and on any given night there are maybe three league average players in their lineup. More heat and more humidity in New York today. At least the real feel temperature was 95° or so rather than 105° like the last few days. Tonight’s game will begin at 7:05pm ET and YES will have the broadcast. Enjoy the ballgame. Injury Updates: Gary Sanchez (groin) will catch nine innings with Triple-A Scranton tonight, and as long as all goes well, he will rejoin the Yankees on Saturday. Hooray for that … Didi Gregorius (heel) had a scheduled light workout day today. He’s getting better and is inching closer to a return … Aaron Judge (wrist) went through another workout in which he did basically everything except swing a bat … Clint Frazier (post-concussion migraines) started a minor league rehab assignment with High-A Tampa earlier today. He went 1-for-3. Not sure what Frazier’s timetable looks like, but the fact he’s now playing in minor league games is great news. That means he’s expected back and relatively soon. Welcome back, CC Sabathia. Sabathia returns from the disabled list after the minimum ten days — well, eleven days because yesterday was an off-day — after dealing with some knee inflammation. It’s going to happen from time to time. The good news is Sabathia only missed one start and is good to go tonight, in the series opener in Baltimore. He returns just in time for Players’ Weekend. The internet tells me it is warm and not overly humid in Baltimore, and the sky is clear. Should be a nice night for a ballgame. First pitch is schedule for 7:05pm ET and you can watch on YES. Enjoy. Injury Updates: Didi Gregorius (heel) has started throwing and could begin swinging a bat early next week. He says the swelling has done down significantly … Aroldis Chapman (knee) received a platelet-rich plasma injection and will be reevaluated in two weeks … Aaron Judge (wrist) still isn’t ready to start swinging a bat. They’re waiting until he is completely pain-free … Gary Sanchez (groin) did not start his rehab assignment today as expected, and instead went through more workouts on a side field. He is going to DH in a rookie ball game tomorrow, then join Triple-A Scranton on Monday … Clint Frazier (post-concussion migraines) could return in September but it is “too early to tell,” according to Aaron Boone. Poor Clint. Roster Moves: Chance Adams was sent down following Wednesday’s game to clear a roster spot for Sabathia, the Yankees announced. No surprise there … Chris Rabago, who the Yankees claimed off waivers from the Rockies earlier this week, has cleared outright waivers, according to the Yankees. The light-hitting catcher remains in the organization as a non-40-man roster player. He’s in Double-A. 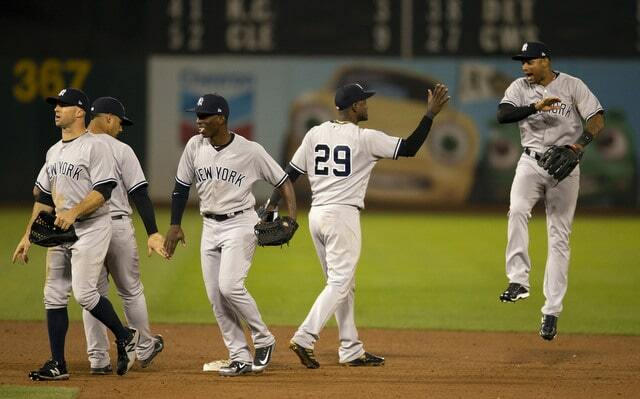 The Yankees now have one open 40-man spot. Rotation Update: J.A. Happ will start the day game and Sonny Gray will start the night game during tomorrow’s doubleheader. The Yankees haven’t said anything, but with Gray making the start, I’d bet on Luis Cessa coming up as the 26th man to be the long reliever. 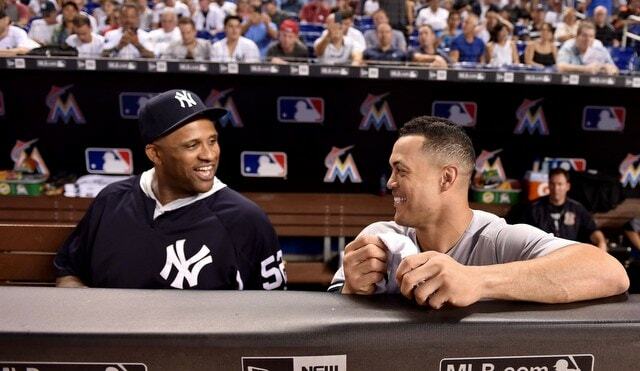 Thanks to the magic of interleague play, the Yankees are in Miami this week for a two-game series with the Marlins. It’s a 2003 World Series rematch! But I don’t like talking about that. 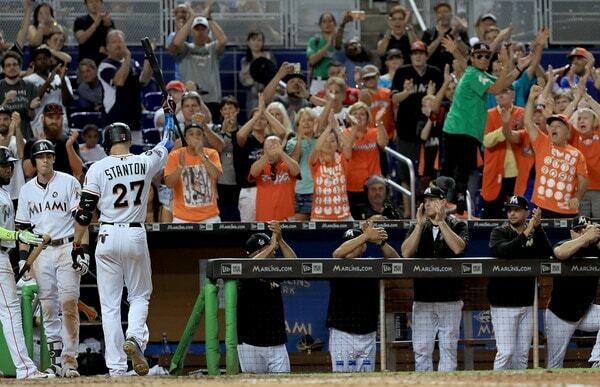 Instead, I look at this week as Giancarlo Stanton’s homecoming. 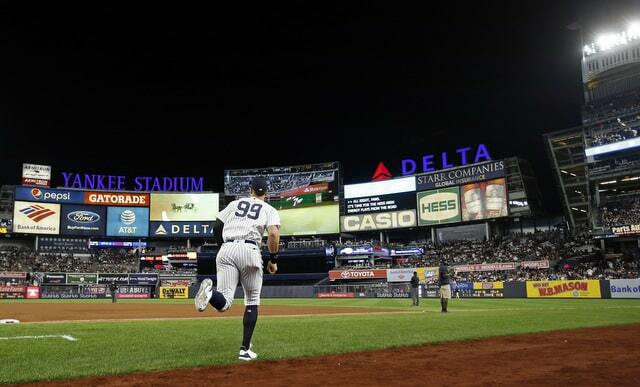 The Yankees poached Stanton from the budget conscious Marlins over the winter and now he’s back in Miami with a chance to hit his 300th career home run in front of his former hometown fans. It is hot and humid in Miami, so I imagine the Marlins Park roof will be closed. First pitch is scheduled for 7:10pm ET and the game will air on YES. Enjoy the ballgame. 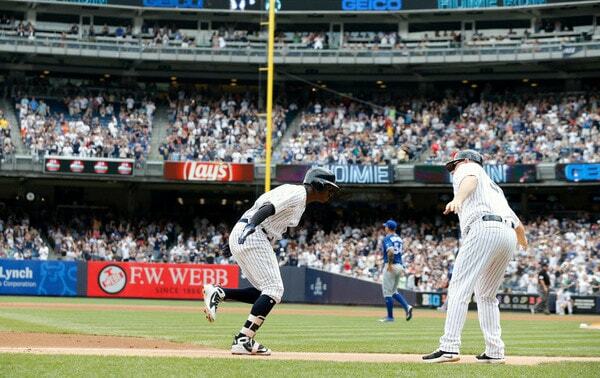 Injury Updates: In case you missed it earlier, Didi Gregorius was placed on the 10-day DL with a left heel contusion. Aaron Boone said the Yankees are hopeful it is a short-term injury. 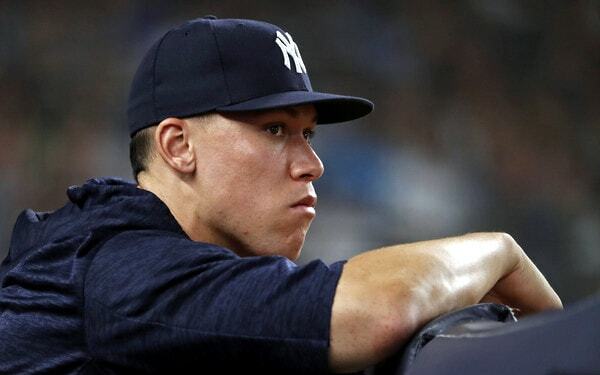 “Next couple of days will tell us,” said Boone … Aaron Judge (wrist) still hasn’t been cleared to swing a bat … Gary Sanchez (groin) will begin a minor league rehab assignment Thursday. He’s going to play “about a week’s worth” of games … Clint Frazier (post-concussion migraines) is showing improvement and has increased his rehab work … CC Sabathia (knee) will come off the disabled list and start Friday. Good injury news? I didn’t know that was possible. So far, so good. 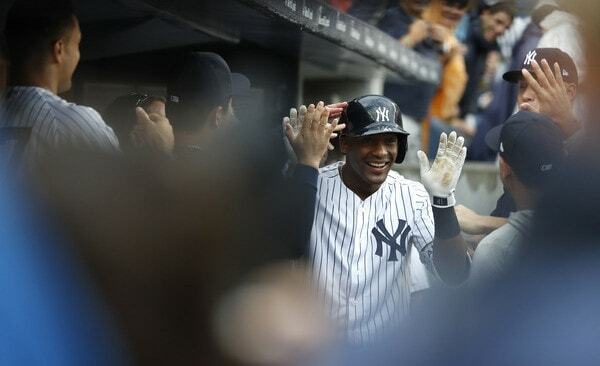 The Yankees are 5-1 in the first six games of this four-week stretch against non-contenders, and today will determine whether they rebound from the four-game sweep in Boston with a 6-1 week or a 5-2 week. Both are good! But man, 6-1 looks sooo much better than 5-2. A win today would be swell. 9. CF Delino DeShields Jr. The rain keeps getting pushed back and it now looks like it won’t arrive until after the game, thankfully. For a while there it looked like this game might have to start in a long delay. That shouldn’t be the case. The skies will be clear for a few hours. First pitch is scheduled for 1:05pm ET and YES will have the broadcast. Enjoy the game. Injury Update: Stanton (hamstring) won’t play the field for at least a few days because he’s still experiencing tightness. They’re not going to push him and risk another outfield injury. Losing Giancarlo would be a devastating blow … Gary Sanchez (groin) has been hitting, running, and going through defensive drills in Tampa. He’s expected to travel to New York today to continue his rehab work. That typically means the player is getting closer to joining Triple-A Scranton or Double-A Trenton for a rehab assignment … Clint Frazier (post-concussion migraines) is hitting and throwing down in Tampa, but he still experiences symptoms throughout the day. He won’t ramp up his work until he is symptom free.